This building, which directly faces the north gatehouse of Kingston Penitentiary, was originally the residence of the prison warden. During the 19th century, it was known as “Cedarhedge”, in reference to extensive cedar hedge (no longer present) that once lined the driveway. The warden is the head of the prison and responsible for administering the institution. Until 1962, the warden of Kingston Penitentiary was also responsible for the Prison for Women, which is located behind Cedarhedge (but no longer functions as a prison). Constructed by convict labour between 1870 and 1873, the house was built from local limestone, which was quarried by prisoners in the nearby quarries and cut in the prison stone-cutting sheds. Ohio sandstone forms accents in the design. Prior to1870, the warden lived in quarters behind the penitentiary walls. In 1869, penitentiary architect Edward Horsey drew plans for an official residence outside the perimeter walls for warden James Moir Ferres. Unfortunately, both Ferres and Horsey died unexpectedly during that year and the project was shelved. When warden Ferres’ successor, John Creighton, was appointed, he found the old residence inside K.P. to be in disrepair. More importantly, being a single father, he did not wish to raise his children inside the prison compound. Canada’s Prime Minister, Sir John A. Macdonald, approved the new policy of permitting the warden to live outside the walls. In the intervening year, the original plans for the house had become lost. Horsey’s son, Henry H. Horsey (1830-1911), also an architect, was directed to redraw the plans from memory. 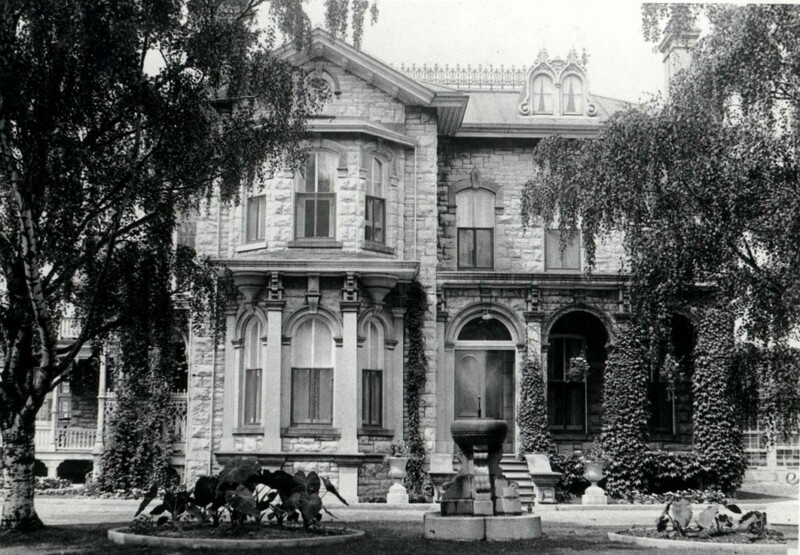 The Creighton family moved in during August of 1873. At least eight wardens and their families lived in the house from 1873 to 1933, when it was converted for offices. Research is continuing the exact number of resident administrators. As late as the 1950s, the Plant Engineers of the prison and their families resided in an apartment in a portion of the house, while offices continued to occupy the rest. In 1985 the Correctional Service Canada Museum moved into two rooms on the first floor of the house. The warden’s offices continued to share the building until 1993, when the last of these offices relocated to the penitentiary making the museum the sole occupant. This building, now home to Canada’s Penitentiary Museum, can be toured by the public.